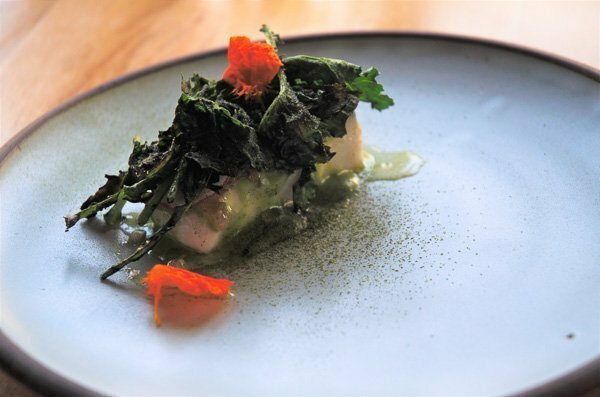 Opened a year ago, Canis Restaurant brings Canadian cuisine with what they call “inspired simplicity”, using seasonal Canadian ingredients to create simple and accessible dishes while highlighting the profile of the ingredients. They are No. 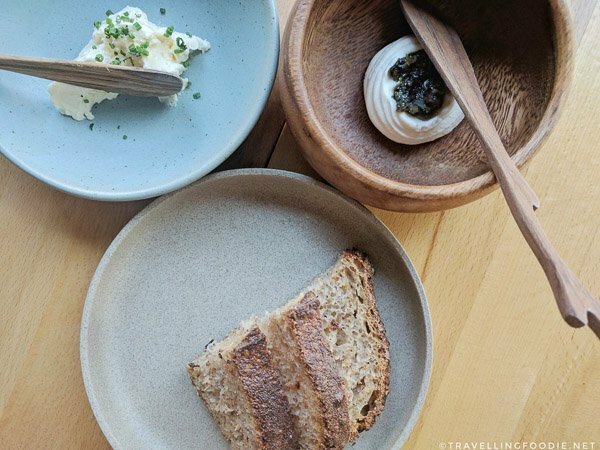 51 in Canada’s Best 100 Restaurants 2017. 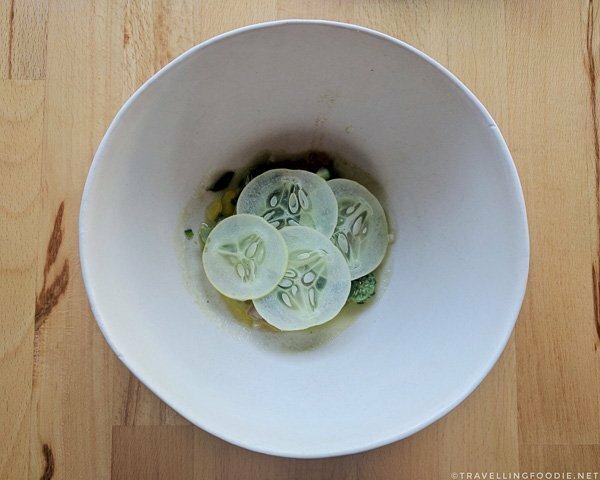 Canis is near Trinity Bellwoods Park in a small sleek and minimalist restaurant that seats 28 people. There is only one table (for four people) by the window so be sure to reserve this table if you plan to take photos – be sure to reserve anyway regardless. Also, note that there is a 2-hour seating policy that is not mentioned in the website nor OpenTable so make sure you arrive on time. There is no a la carte menu, but two fixed menu options: a four-course pre-fixe menu ($65), and a seven-course tasting menu ($85) with a wine pairing option ($60). One thing to note is the items on the pre-fixe are different from the tasting menu. I wanted the tasting menu with most courses as I usually do. I always want to maximize the experience since I don’t know when I’ll be back again. In this case, an extra $20 for 3 courses was a pretty reasonable price. I was surprised to learn that the Chef is Asian because the cuisine and the type of dishes is definitely not common for Asian chefs. Chef and owner Jeff Kang came from Vancouver where he was “B.C. Chef of the Year” in 2012. He moved to Toronto and was the Chef de Cuisine at Bosk at the Shangri-la before opening Canis. Interestingly, their drinks menu only offers wine and beer, no cocktails. 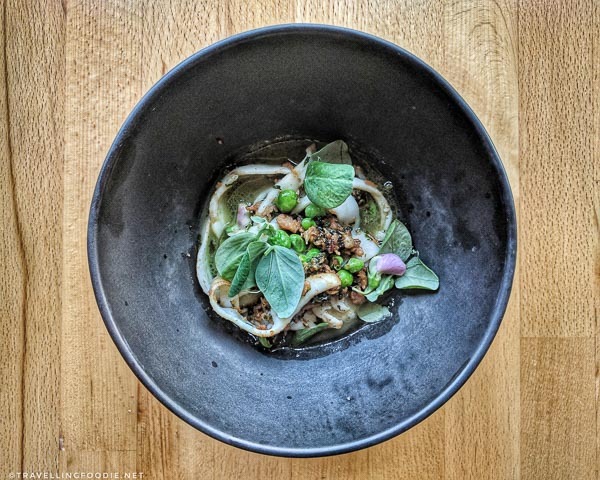 We don’t get many of these kinds of restaurants in Toronto due to the rise of #foodporn trends for Instagram. 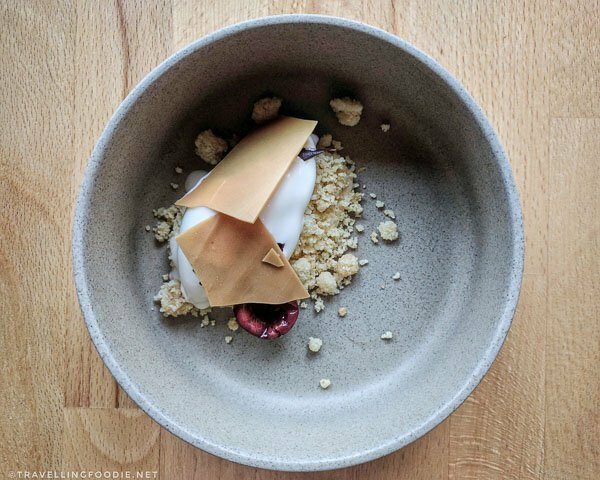 Hopefully, with the rising popularity of restaurants like Alo, Doma, Edulis, and Canis, we see more of these creative tasting menu restaurants in Toronto. The tasting menu was simply amazing! 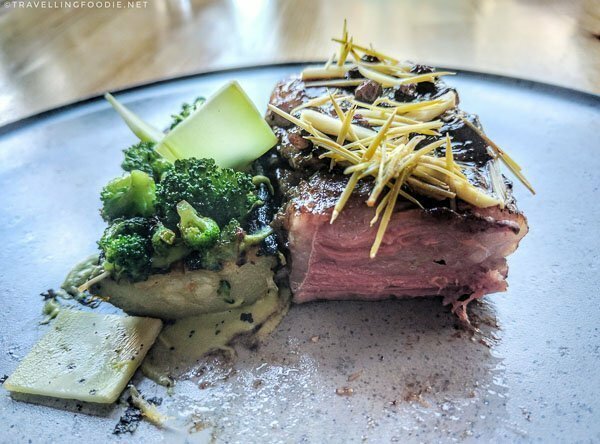 Each dish was carefully thought out with the ingredients really complimenting to bring out the profile of the dish’s main ingredient, be it the meat or seafood. 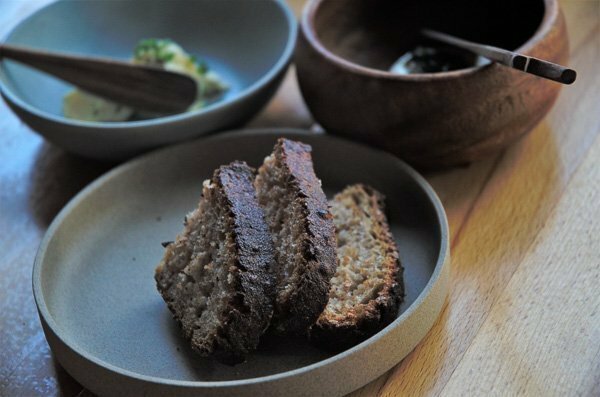 I also like the plates they use – very simple and minimal, and it looks really nice with how they plate the food. It’s also nice to do top-down shots of all of them for consistency with the plate (which you’ll see further down). One thing about their plating is all the veggies tend to be on top so doing top-down captures mostly the veggies in the dish. Though it was advertised as seven courses, there were actually a total of nine because of the initial bread course and the last surprise dessert course. Our tasting started with some Homemade Sourdough Bread, which was crunchy on the outside, and warm and moist inside. They have started milling their own flour to make their own bread. I was addicted to the whipped garlic butter that came with it! 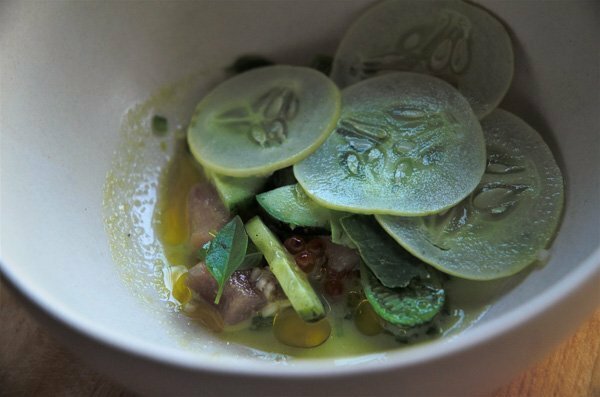 The Tuna was so fresh, which was elevated even more by the refreshing Heirloom blonde cucumber and herbs. 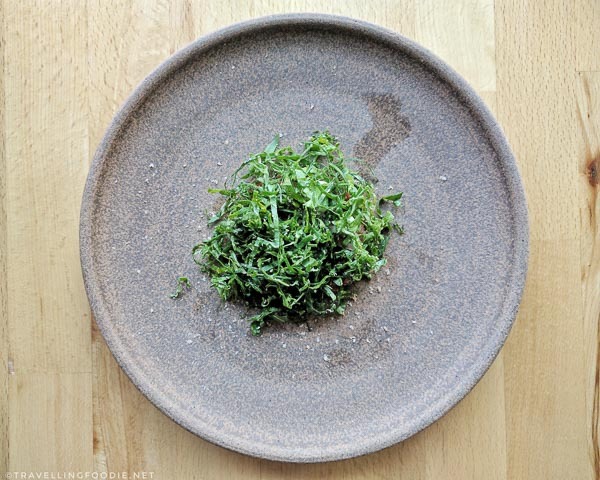 When the Beef Tartare first came, I was worried because all I saw were greens. The beef tartare was actually underneath. 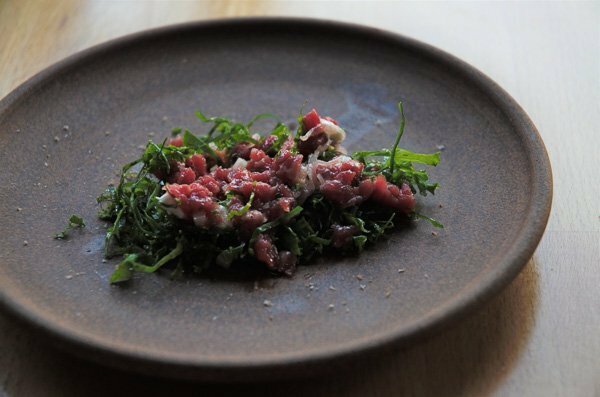 Once you mix them up, it’s just a heaven of subtle flavours accentuating the beef, which is a hard feat because raw beef is not as strong as cooked ones. This is now one of my favourite beef tartare dishes in Toronto, alongside Thoroughbred Food and Drink. The Squid dish was particularly interesting because the squid actually looked like pasta, and also had a noodles texture. Nonetheless, it was nice and had the right chewiness. 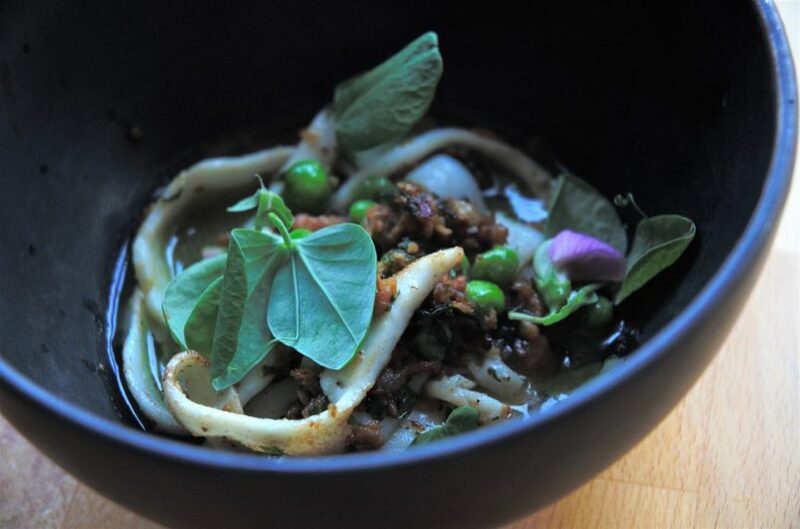 I loved it with the fermented pea broth, making sure I didn’t leave a drop of it. Halibut is usually a tough one to cook well. I find it can easily get overcooked, making it dry and tough. The Halibut here was just perfect – very juicy and tender – and I love the thick cut they gave. However, I found the grilled rapini to be too bitter that it overpowered the halibut. I had to eat it separately so that the fish doesn’t get wasted. I also couldn’t really taste the dried scallop. The fanciest course in presentation was the Beef Short Rib. Chef Jeff Kang personally served this to us. It initially came in one big circular platter with some sort of sack and some roasted pine leaves, giving such wonderful aroma. On top were the big beef rib bone which had the beef short rib on top. 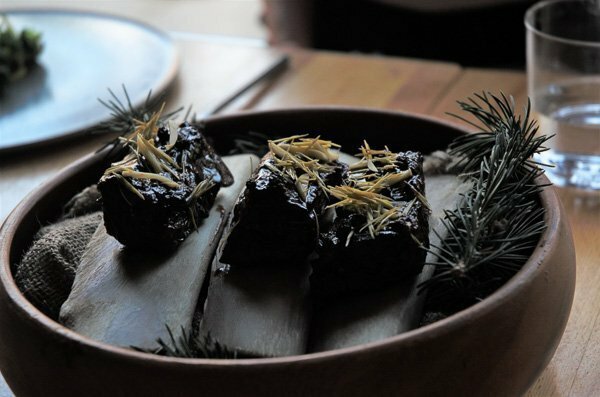 After the initial presentation, chef took each short rib from the bone and placed it on our plate (check out the video above). This was the highlight for me. The beef short rib was very well marbled and melts in your mouth. I love the use of black garlic glaze here to give a bit of sweet yet charred taste. 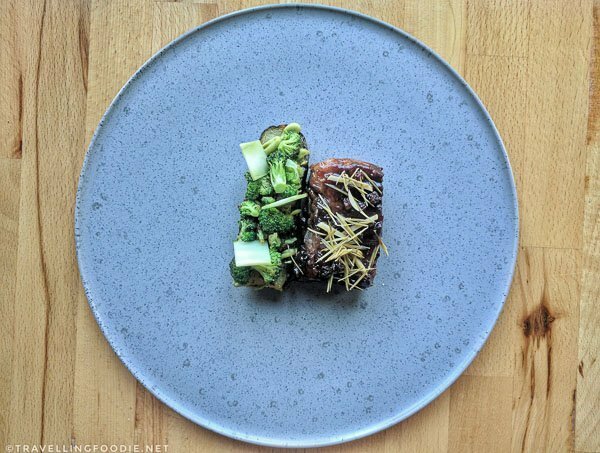 The grilled zucchini with broccoli was perfect in balancing the fattiness of the short rib. Raspberry dessert was mind blowing because it looks so simple, but it actually did taste like I was eating real snow. 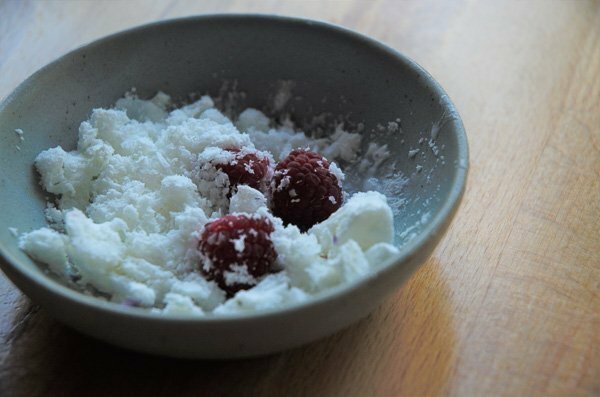 The buttermilk snow was great in cleansing the palate, though it was actually a dessert course than a palate cleanser. 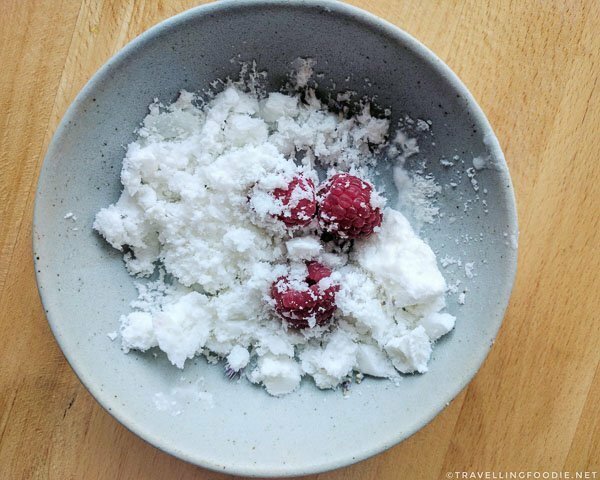 The acidity of the raspberry helps cut the creaminess of the snow. Bringing some Asian influence to the dish, Koji is a mold used mostly in Asian cuisine, often associated with Sake and in making soy sauce. This was such a fun dessert because of the different ingredients included. You get crunchy, chewy and creamy all together. You also get tanginess from the cherry and hibiscus as well as sweet from the white chocolate. But wait, there’s more! When we thought we were already done and ready to pay the bill, we were served another bonus dessert, Coffee Canele. Canele is a rum and vanilla based French pastry with crispy exterior and custard centre. This was my first time having it, and I thoroughly enjoyed it. The custard centre felt similar to bread pudding which I like. The coffee flavour in this one was quite strong too, which I loved. I highly recommend Canis especially if you’re into this kind of fine dining or tasting type restaurants. If you’re not, I still highly recommend it as it seriously will open your tastes to special culinary experiences. It’s also a great place for a special occasion or dates. When should you go? How about now! I have a feeling it won’t be long until Canis have similar waitlist as Alo. 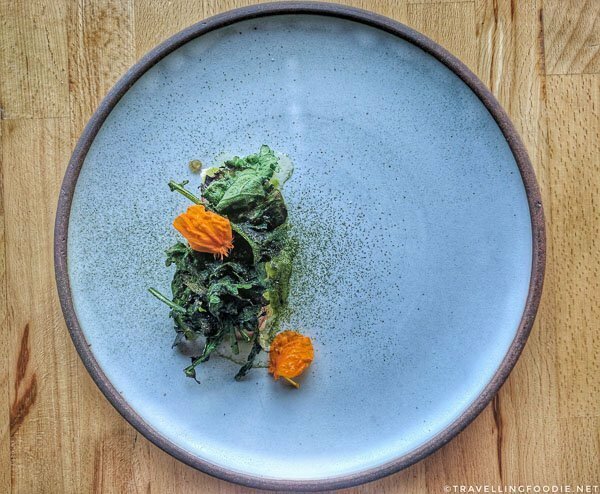 Posted on August 17, 2017 December 31, 2018 by Travelling FoodiePosted in Canada, Food, Ontario, TorontoTagged restaurants.